Art in Maternelle is taught not only through the discovery of materials and colors but also through music and performances. In art as well as in music and performance, the focus is on teaching children to express themselves: express feelings, ideas and thoughts. Children express their feelings and emotions in a safe way. They learn to control their emotions and recognize that they can express and handle negative as well as joyous feelings through positive action. Children practice and gain fine muscle control and strengthen eye-hand motor coordination. By holding paintbrushes and learning how to control paint, crayons, scissors, and other art tools, children gain the skills necessary for later writing activities as well as a feeling of control over themselves and their world. Children develop perceptual abilities. Awareness of colors, shapes, forms, lines, and textures result as children observe these and try to replicate them through art. Children make choices and solve problems. How do you get the legs to stick on a clay figure? What color should I use? 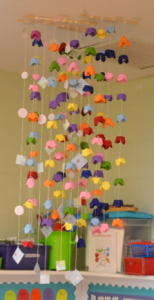 Making art offers children a multitude of choices and many decisions to make. Children see that others have differing points of view and ways of expressing these than they do. 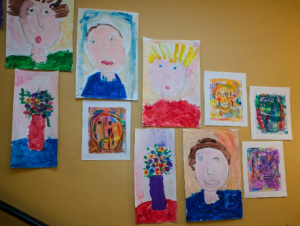 Comparing children’s drawings, paintings, or models gives children concrete, dramatic examples of how different people express the same thing in different ways. While learning that their way is not the only way, they learn to value diversity. Children become aware of the idea that, through art, culture is transmitted. Becoming acquainted with the art of the past, children are involved in learning something of their origins and themselves. Children experience success. Because art leaves the end open to the creator, all children experience a measure of success. Children make connections between the visual arts and other disciplines. Art integrates the curriculum. Content from every subject matter can find form through art.